Origami, the Japanese art of paper folding, can be used to create beautiful birds, frogs and other small sculptures. Now a Binghamton University professor Sean Choi says the technique can be applied to building batteries, too. 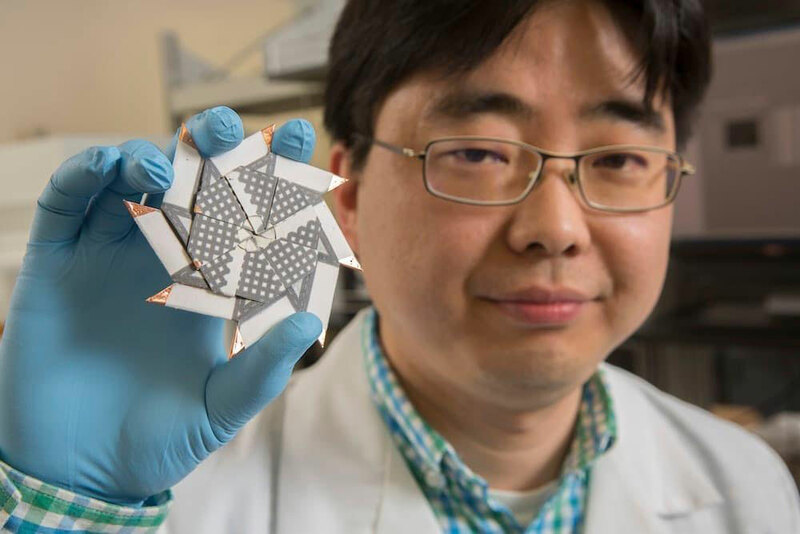 He has been attracting attention from the science community for his origami-like battery design, which is shaped like a ninja star and helps preserve energy. Assistant professor Sean Choi of electrical and computer engineering and the director of the bioelectronics and Microsystems lab designed this battery, which can be powered by the bacteria found in a single drop of water. This research is funded by the National Science Foundation, aim was to develp a low-cost alternative to currently available battery products to be used in small devices like pregnancy or HIV tests. The origami-like battery collapses like a paper origami star and stacks eight battery modules, has exponentially increased the potential power output of the battery. It costs around 70 cents; due to carbon cloth and a small amount of copper tape are part of the device’s composition. A few drops are required to get power to the battery as the user changes the shape from a ninja star to a circular, Frisbee shape. It can power an LED light for about 20 minutes before running out of energy.